What does writer J.R.R. 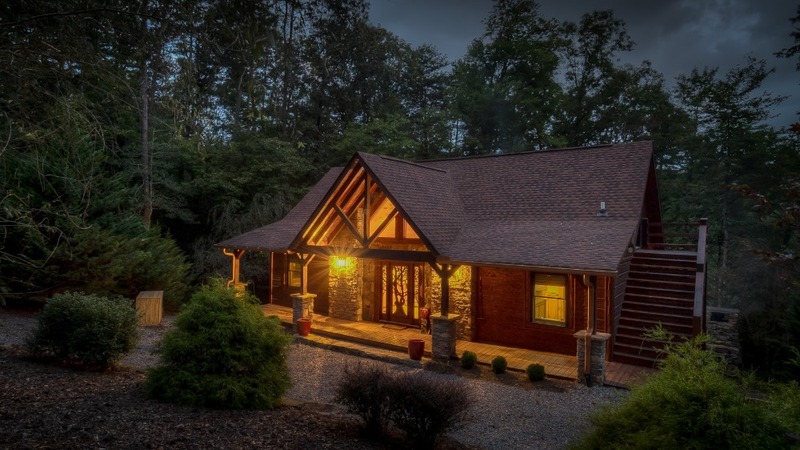 Tolkien’s “The Lord of the Rings” (and the movies based on it) have to do with a North Georgia cabin rental? As it turns out, more than a name. Along with everything you expect—handsome design, great location, lots of space, and all the amenities of home--Middle Earth has something extra: a one-of-a-kind “LOTR”-themed room that will delight fans of the fantasy story. Descend into the basement of this spacious mountain home and you’re instantly transported to another time and place. Dubbed the Green Dragon Pub, the medieval lair is decorated with “LOTR” memorabilia and themed games (Monopoly, Trivial Pursuit and Risk) and three enormous throne chairs straight out of the Shire. You’ll want to take a selfie and post it with hashtag #middleearthcabinga to impress your friends back home. Middle Earth is magical in many other ways, as well, starting with its stunning natural setting. 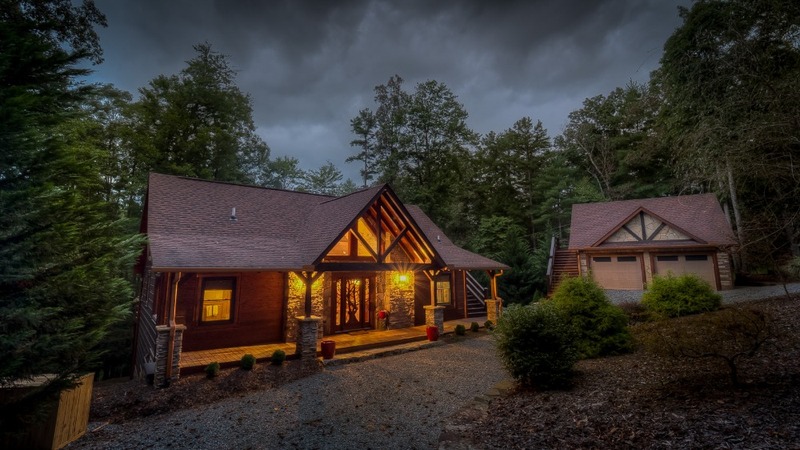 Conveniently located near Fightingtown Creek and not far from Toccoa River, Cherokee National Forest and the Aska Adventure Area, the cabin is close to boating, fishing, hiking trails and orchards, and less than six miles to downtown Blue Ridge. With majestic tall trees surrounding it and giving it a tree house feel, you’ll step onto the upper deck and feel calm, relaxed, and at one with nature. 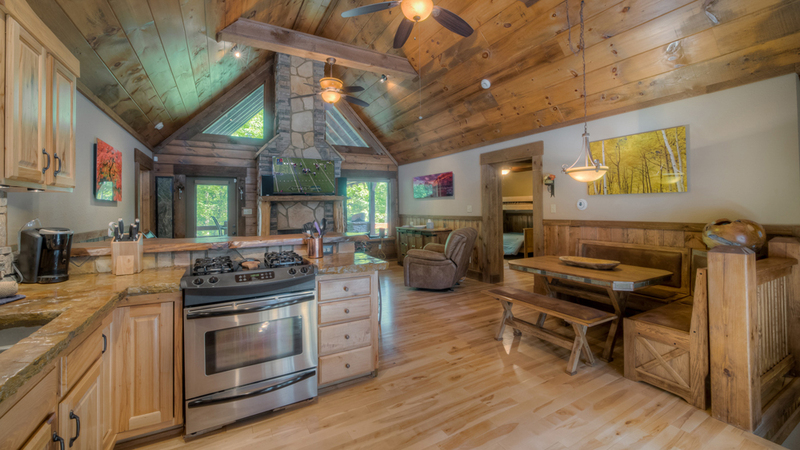 Inside, the cabin is comfortable, inviting, and decorated in a dramatic rustic but non-traditional style that mixes woods, metals and stonework in a unique way, accented by colorful artwork depicting nature. 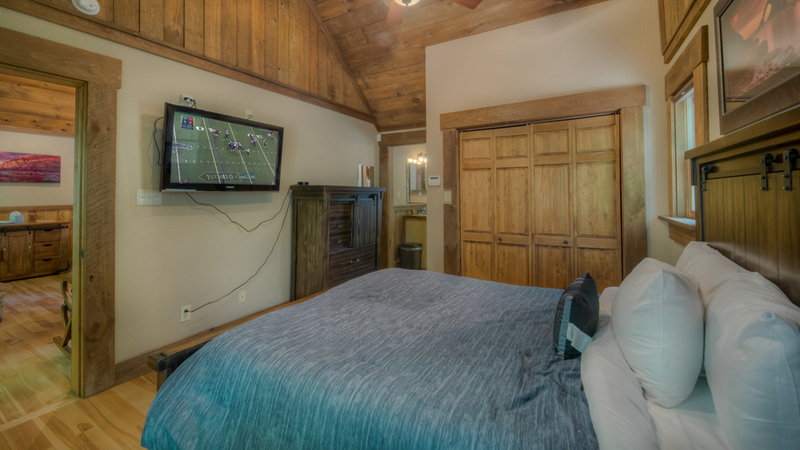 There are two living areas, on the main floor and lower level, each with a gas fireplace and 55” UHD or Ultra Hi-Def smart TVs, outfitted with DirecTV, Apple TV and popular streaming services, and on the main level, JackBox games. Downstairs, there’s a state-of-the-art electronic dartboard, a tournament-level foosball table, and a Sonos sound system with PlayBase and subwoofer. There’s another small game room in the loft, outfitted with Atari Classic and Nintendo Classic Edition systems and lots of games. The well-appointed kitchen features a live-edge wood counter and stone countertops, four-burner gas stove/oven, stainless steel refrigerator with icemaker, a new dishwasher, garbage disposal, microwave, Keurig coffeemaker, and a crockpot. The L-shaped dining table seats six. If you’d rather grill your dinner and dine outdoors, just head out to the main deck. 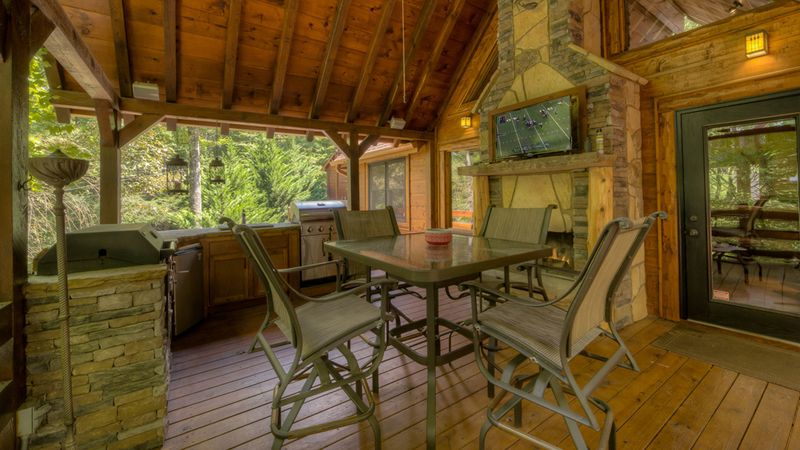 There, you’ll find both a gas grill and a charcoal grill/smoker with a handy outdoor sink beside it, a 40” high-def TV with DirecTV and the NFL Sunday Ticket package, and a wood-burning fireplace. On the lower deck, there’s another fireplace and a new six-seat hot tub with LED lighting and music to set the ultimate relaxing mood. You’ll dream in comfort in the cabin’s three comfortable bedrooms, outfitted with luxury bedding and premium pillows and cooled by ceiling fans. 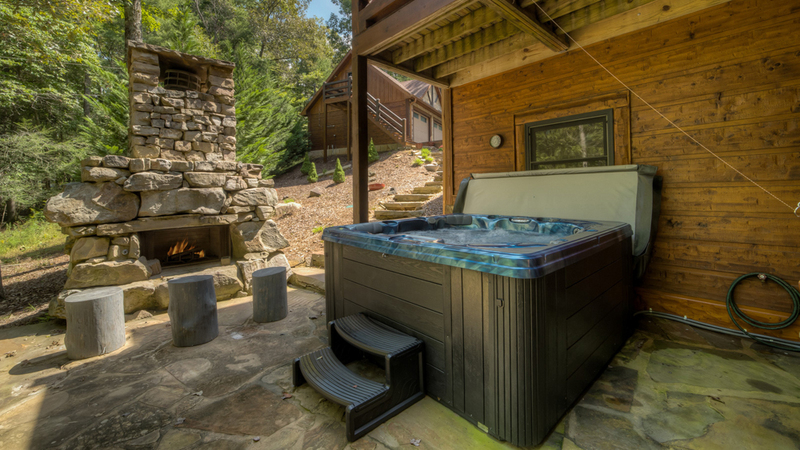 The high-ceilinged master bedroom has a queen bed, 43” hi-def TV with DirecTV and Apple TV, and a private bath with natural stone flooring, counter and walk-in shower, Jacuzzi tub, double copper sinks and a large window that overlooks the woods. The downstairs bedroom has a queen bed and adjacent bath with double copper sinks, large natural stone shower. And, ideal for up to five kids, the upstairs bedroom has a pair of bunk beds—twin over full and twin over twin. A queen-size futon in the game room brings the sleeping accommodations to 10. 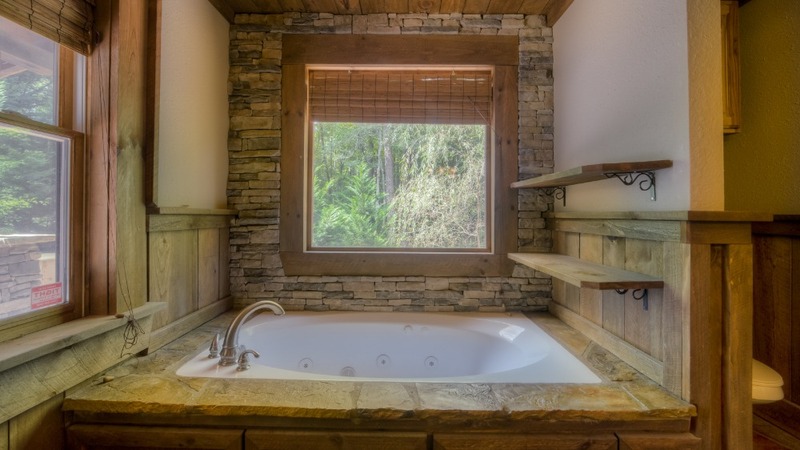 The third bathroom features a stone counter, single copper sink, shower/tub, and a stacked washer/dryer. If you’re ready to experience the fun and fantasy of a truly special mountain adventure, pack up your family and canine best friends and come to Middle Earth for a vacation you’ll never forget. 11/18 - The children loved the middle earth theme. The company is very organized. 04/19 - Beds, fireplaces, hot tub, TV setup. It was all perfect! Family can’t wait to stay there again! 04/19 - Loved the outdoor porch with fireplace. 09/18 - This home is perfect in every way, we enjoyed relaxing in the game room, dinner on the back deck, and hiking through the woods and down to the river. The beds are amazingly comfortable, you will not want to leave this place. My family cannot wait to return to this mountain paradise! Our stay was flawless, every need was met, I cannot recommend this home highly enough. 6 Stars out of 5!!! 09/18 - This was our third trip to Blue Ridge. This place is fabulous with details in mind and built well. We had 4 adults and 2 teenagers with plenty of room to spare. It is nicely decorated throughout. The bedrooms are good size and the owners spared no expense for good mattresses and bedding. You will have a good night sleep here. We loved the rustic stone showers with overhead fixtures. Great jetted bath in the master bedroom. The kitchen has modern appliances and a nice good size eating area. Main Bathroom has washer and dryer. The great room is very comfortable with huge TV above the fireplace with a lot of the latest programming services. 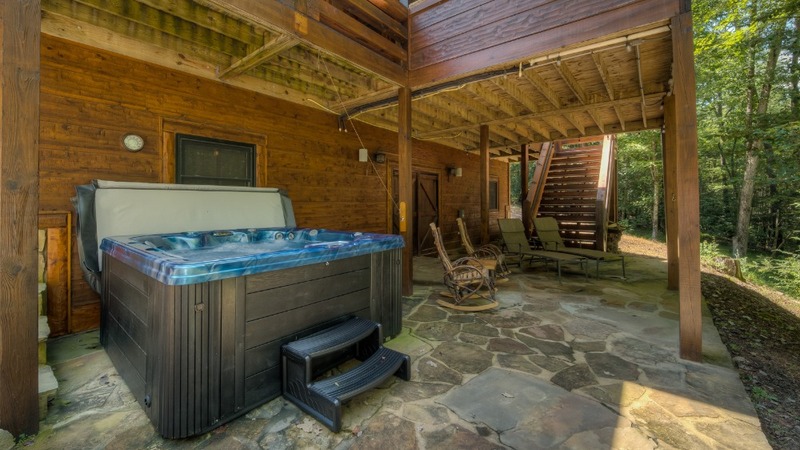 There is an upper deck outside with another fireplace, TV, gas grill, smoker and fridge. This is where we spent most of our time. 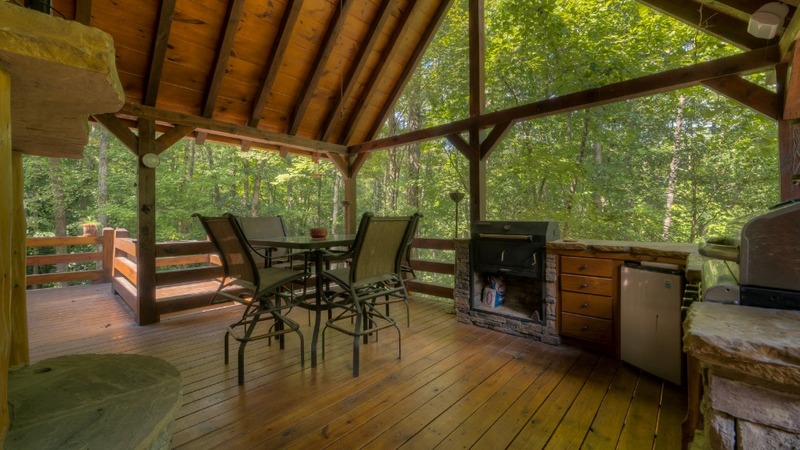 It was very relaxing to sit back and chill out and view the woods behind this property. 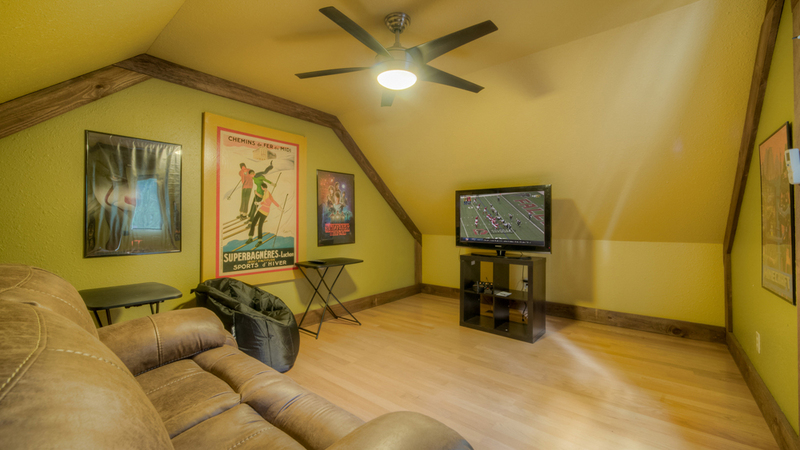 The downstairs is a great place, too, with a big bathroom,bedroom, game room, bar and fireplace. There is a small adjoining room where you can play chess and feel the warmth of the fireplace. The teenagers stayed on this bottom floor and said it was like having their own resort with plenty of things to do. They brought their X Box and hooked it right up so they could communicate with their friends back home. 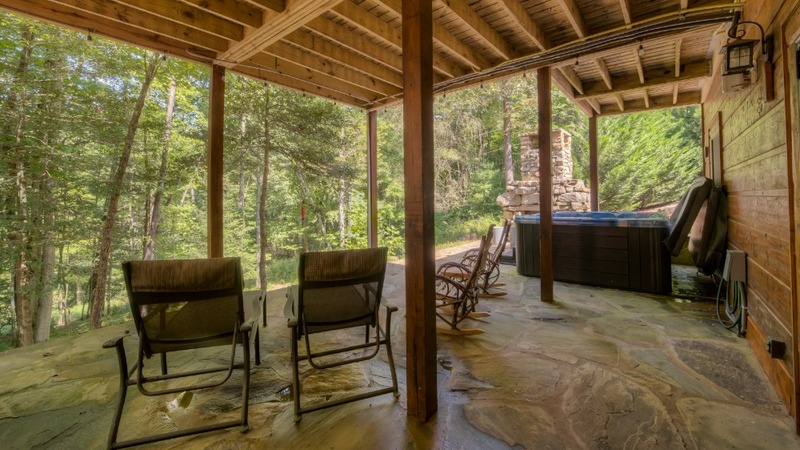 Right outside the bottom floor is another deck with a hot tub and an outside old style stone fireplace which made for perfect evenings to wind down the day. 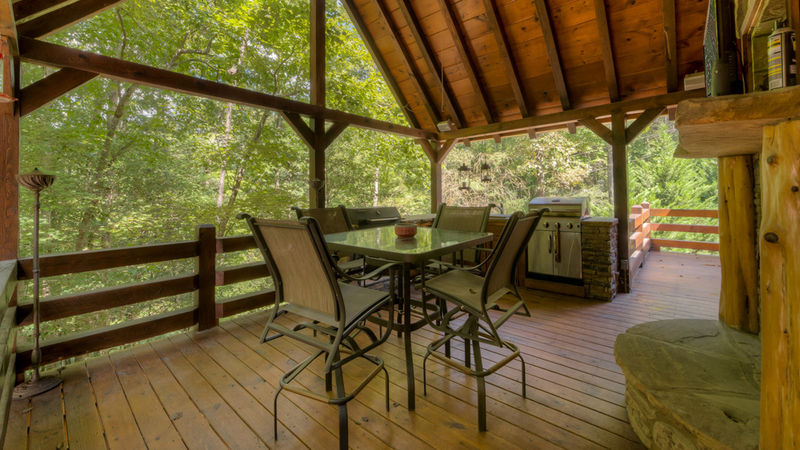 The access roads to the cabin are well maintained and you are only a few minutes to town. Everything in this place impressed me so much that we will stay here again on our next trip to Blue Ridge.